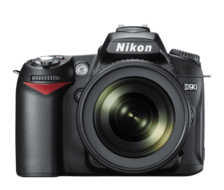 World’s first D-SLR with an HD movie mode: Record exceptional 24fps movie clips with sound at up to 720p HD (1280 x 720 pixels) in Motion JPEG format, enhanced by NIKKOR interchangeable lens quality and versatility. High resolution, 170-degree wide-angle viewing guarantees confident image review and movie playback. 11-point AF system: Consistently fast and accurate autofocus, reinforced by the Nikon Scene Recognition System, delivers razor sharpness in a wide variety of conditions. Testing to over 100,000 cycles assures shutter life and accuracy. Creative freedom stems from exclusive in-camera image editing, featuring Fisheye effect, Straighten and Distortion Control as well as D-Lighting, Red-eye Reduction, Image Overlay, Monochrome and more. GP-1 GPS unit (optional) provides automatic real-time geo-tagging. AF NIKKOR other than D-type: All Functions Supported Except 3D Color Matrix Metering and 3D Multi-Sensor Balanced Fill-Flash for D1-Series.